Fabien Castanier Gallery is proud to present Still Life, a solo exhibition by contemporary artist Mark Jenkins and the first solo show for the artist at the gallery. Mark Jenkins is a sculptor and installation artist whose work focuses on a variety of urban and social themes, re-defining the limits of sculpture both in the public sphere, where many of his pieces have been found, to the more intimate realm of the “White Cube.” The foundation of his artwork is in the artist’s specific technique, casting objects as well as his own body (and those of others) using conventional packing tape and plastic wrap. Encompassing the actual form of these subjects with his method, he has materialized a range of characters, from translucent ducks, dogs and babies, to his most well-known clothed hyper-realistic figures. In Still Life Jenkins presents an all-new body of work created here in Los Angeles. The collection features an evocative series of site- specific installations, including three-dimensional canvases, incorporated taxidermy, a human birdhouse and anthropomorphic stringed instruments. Akin to traditional notions of the “still life,” his sculptures capture moments that conjure their own realities, presenting tableaus that challenge one’s sense of what is real and what is not. 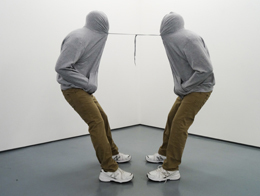 Jenkins constructs his people, animals, children – entities commonly filled with life – into inanimate objects, frozen in bizarre postures and scenarios. By creating these unconventional situations, he re-contextualizes commonplace ideas or things and inserts them into a new landscape in which the viewer plays an integral part. Opening reception will take place on September 5th from 6:00 -9:00 pm.